As a novelist, Stephen King needs no introduction. He is perhaps the bestselling, most widely read horror author of all time and among living writers he has no equal in any genre in terms of success, popularity and influence. What is perhaps less well known is that King not only writes fantasy novels, as well as the horror for which he is best known, but he is also an avid reader and fan of fantasy fiction. It was in fact an early reading of Tolkien’s Lord of the Rings that led in part to the creation of King’s own fantasy epic, The Dark Tower series. Far from being a mere side interest The Dark Tower actually stands at the heart of King’s imaginarium – as he has said on many occasions, this series is not only King’s magnum opus, it is the glue that binds together his entire literary output. In his own mind every single story that King has written is connected, even if there is no evidence in the story itself of this connection, and this makes The Dark Tower a very intriguing series indeed for any self-respecting King fan. Incorporating themes from multiple genres, including fantasy, science fantasy, horror and westerns, The Dark Tower has almost as many sources: the poem Childe Roland to the Dark Tower Came by Robert Browning, Arthurian legends, the films of Sergio Leone and the aforementioned Lord of the Rings have all, at one time or another, been cited as influences on King. In spite of this, The Dark Tower is one of the most original, compelling and downright frightening works of fantasy ever written. It is also, even eight books later, far from finished. The Gunslinger (1982), which is the first volume in The Dark Tower series, introduces us to Roland Deschain, the last gunslinger alive. Roland lives in a post industrial world that has reverted back to almost medieval conditions – according to its inhabitants it has ‘moved on’. A little at a time Roland’s background is explained – how he grew up among the ruling class of his country, and how he lost everyone dear to him in the revolution that brought an end to the rule of the gunslingers and laid his home of Gilead in ruins. Now all he has left is the search for an elusive ‘man in black’, and ultimately finding the Dark Tower, a place that is reputed to be of great importance, but is shrouded in mystery. I think that it is fair to say that The Gunslinger is by no means the most loved of King’s books – it is fairly short, not a great deal happens and none of the characters really capture the reader’s interest – but that is partly a function of its role as a gentle introduction to the grim world of Roland of Gilead. Even King revised this initial volume some thirty years after it was first published in 1982, perhaps in recognition of some of its more obvious weaknesses. However, as a prologue to the series proper, it does a reasonable job. From the start, King’s many and varied influences are clear. The ‘gunslingers’ themselves are more like knights in the way that they are described and Roland himself is said to be the last of the line of ‘Arthur Eld’, his world’s analogue of King Arthur. His world shares technological and social characteristics with the American Old West but politically it is organised along the lines of a feudal society. As the series opens, Roland’s motives, goals and even his age are unclear, and it is only in later instalments that light is shed on these mysteries. Roland’s quest is to find the Dark Tower, a fabled building that is said to be the nexus of all universes. Along his journey to the Dark Tower, Roland meets a great number of both friends and enemies. For most of the way he is accompanied by a group of people who together with him form the ‘Ka-tet of the Nineteen and Ninety-nine’, consisting of Jake Chambers, Eddie Dean, Susannah Dean and Oy. Among his many enemies on the way are the Man in Black and The Crimson King. Numerous elements serve to highlight the books’ strange fusion of fantasy, horror, science fiction and western. King’s style of location names in the series, such as Mid-World, and his development of a unique language abstract to our own (High Speech), are directly influenced by Tolkien’s work. At the same time Clint Eastwood’s ‘Man with No Name’ character is just as obviously one of the major inspirations for the protagonist, Roland Deschain (as the artists behind several book covers have not been slow to realise, apparently!). Besides the eight novels that compose the series proper, many of King’s other novels relate to the story, introducing concepts and characters that come into play as the series progresses. While the series was declared finished with the publication of the seventh volume in 2004, King later declared that the sequence was in fact not complete and that the ‘first seven books’ were in fact only the first part of one long uber-novel. Sure enough, after the saga was finished, a further series of prequel comics followed and an eighth novel was published in 2012. On a not-unrelated-point, it has to be said that The Dark Tower series is by no means the most popular of this phenomenally successful author’s books. King’s writing style is not naturally suited to the fantasy genre and The Dark Tower suffers from the fact that many of the main characters are quite cold and aloof, meaning that it is sometimes a bit difficult to care about what is happening to them. There is no doubt about how seriously King himself takes the story or how close it is to his heart, but this becomes another problem when his prose turns unnecessarily grandiose and filled with its own sense of self-importance. If nothing else, the sheer length of the series ensures that when it comes to The Dark Tower only the truly committed tend to stay the course. But this has its own rewards. I said earlier that The Dark Tower series is in many ways the linchpin that ties together much of King’s body of work. The Dark Tower universe is composed of locations, characters, events and other elements from many of King’s novels and short stories and part of the joy of reading the series is discovering the many interconnecting threads. Father Callahan, a major character in the latter part of the series, first appears in Salem’s Lot, originally published in 1975, seven years before the first book in the series and twenty-eight years before his reappearance in the fifth. The world of The Stand, first published in 1978, is visited in the fourth book of the series – the villain Randall Flagg is also one of the main antagonists in the world of The Dark Tower. In Rose Madder, the eponymous heroine travels to a different world, where she meets a woman who mentions a location from Roland’s universe. It, Hearts in Atlantis and The Mist also have major connections to The Dark Tower, while the number of King stories with minor connections is almost beyond count. Perhaps the most intriguing thing about The Dark Tower, however, is that, given that almost every Stephen King story from Carrie (published in the 1970s) to Dreamcatcher (published in the 21st century) has been adapted into a film or television series, it is surprising that to this day no one has attempted to do the same to any part of the story that is the magnum opus of one of the most-filmed authors of all time. The rights have been optioned and the latest word is that filming may start as soon as 2013 but I for one wait with interest to see what cinema does with one of the most daring, unusual and difficult works of perhaps the most popular living author in the world. Even though I like S. King’s work and in my mind he is a terrific storyteller, I was not enticed by the DT series, and now I know why. Thank you for your great review! To have a book as prologue that really doesn’t offer the reader much but questions and settings would never fly for anyone else but the indomitable King. That said, his work is amazing, terrifying and entirely twisted. I think NIGHTMARES AND DREAMSCAPES (his short stories) should be read by anyone who would like to attempt writing fiction. It is a top-shelf example of how one can draw the reader into another reality in only a handful of pages. It is the definition of making every word count in the darkness of a writer’s mind. Thanks for pointing out ‘Nightmares and Dreamscapes’. I’ve only read a few of King’s novels and none of his short stories and am currently looking for anthologies worth sinking my teeth into. I read the first book and loved the simplicity of it. The letter in the beginning too explained how he was attempting to make something similar to Lord of the Rings, but that fantasy and elves had been overdone. I loved The Dark Tower Series so much (except Song of Susannah). The latest book didn’t seem to quite mesh with the rest of the series, but it was a cute little story in it’s own right (I know, who calls Stephen King’s work “cute”?). I loved the way he tied in so many of his other books – it gave me a whole summer of nothing except SK reading. Yes, it’s great when that happens! I am very dedicated Tower and King fan, I have loved it from the word go. I agree with your comments about it needing some commitment to engage in the series, but it is far less than you need to slog through the Wheel of Time, or the Sword of Truth series. I think the limited amount of characters it has makes it leaps and bounds easier to get into than other epic fantasy series. Great review. 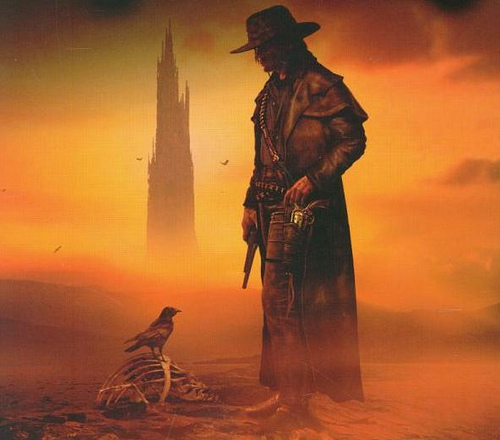 I’ve contemplated reading The Dark Tower series for some time–and I may still. Might be fun to dedicate a summer of reading to it.